The first Hebrew congregation began worship in Auckland in 1843. Their first formal place of worship was located in Nathan & Joseph's Warehouse in Shortland Street. By 1853 the congregation had grown to 100 and worship was held in a small building in Emily Place. By the 1860s this building had become too small for the rapidly increasing Jewish population and funds were raised for the construction of a synagogue. In 1884, the Jewish Community purchased a section on the corner of Princes Street and Bowen Street. At that time the site was occupied by the former Albert Barracks Guard House, which overlooked a vegetable garden, which had formerly been used by soldiers. The community approached 10 architects and Edward Bartley was chosen to design the new synagogue. Bartley was an Irish architect who had come to New Zealand in 1854 and made a name for himself in Auckland. Other significant buildings designed by him include the Foundation for the Blind Jubilee Building, the Wellesley Street Opera House (which burnt down in the 1920s) and the ASB in Queen Street. Bartley's design was influenced by the synagogue built in 1881 in Glasgow. The building was designed in a mixed Romanesque and Gothic style. It was built out of concrete at a cost of 3000 pounds and could seat a congregation of 375. It incorporated a sabbath school in the basement. The interior ornamentation was by the decorator J.L. Holland and the stained glass dome was imported from Australia. The synagogue is the only historic building of its type in the Auckland region and one of only two 19th century synagogues surviving in NZ. 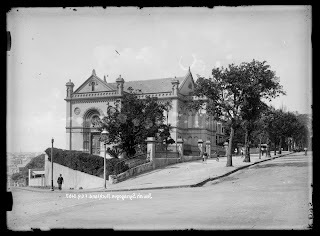 It acted as Auckland’s main synagogue and focal point for the Jewish community from 1885 until 1968, and was associated with many notable Aucklanders, including civic leaders. 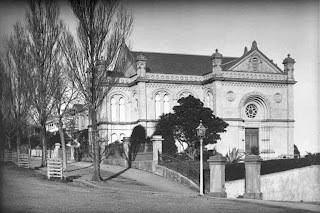 The Former Synagogue is registered by the New Zealand Historic Places Trust (NZHPT)and has Historic Place Category 1 status. The interior of the building features Auckland’s only known example of a barrel vaulted timber ceiling and an ornate circular ark covered by a stained glass dome. It is also one of NZ’s oldest massed concrete buildings. A basement was used for social and educational purposes and a school annexe was added in 1914. For more information about Jewish settlement, 'The history of the Jews in New Zealand' (1958) by Lazarus Morris Goldman has information about the first Jewish settlers in New Zealand. Whilst 'Identity and involvement II : Auckland Jewry, past and present' (1993) edited by Ann Gluckman and Laurie Gluckman ans 'Some of the Jewish men & women who contributed to the history of Auckland, 1840-1982' (1982) compiled by Lionel Albert.has information specific to Jewish settlement in Auckland. Auckland Libraries also has a large number of other heritage resources relating Jewish family genealogy, cemeteries and immigration.